An easy recipe for a variety of delicious Almond Cinnamon Thumbprint Cookies with a video tutorial to help you make these cookies. The base of these cookies is a buttery, aromatic shortbread which are usually filled with jam but they are so good why only add jam? They can be transformed into something different each time by changing the flavour or filling them with a different jam, marmalade, lemon curd, chocolate ganache, dulce de leche, etc. I based my recipe on my Shortbread Cookies but they can be made with brown sugar instead of icing sugar. These cookies were named thumbprint because they would make an indent with their thumb before baking and then add the jam when they were baked. I make the indent after they are partically baked. However, it would not be wise to use your thumb while they are hot, so I improvised using something metallic to make the indent. The first time I used a spoon, then the valve of my old SEB pressure cooker and then I remembered my pestle, which is the most practical. 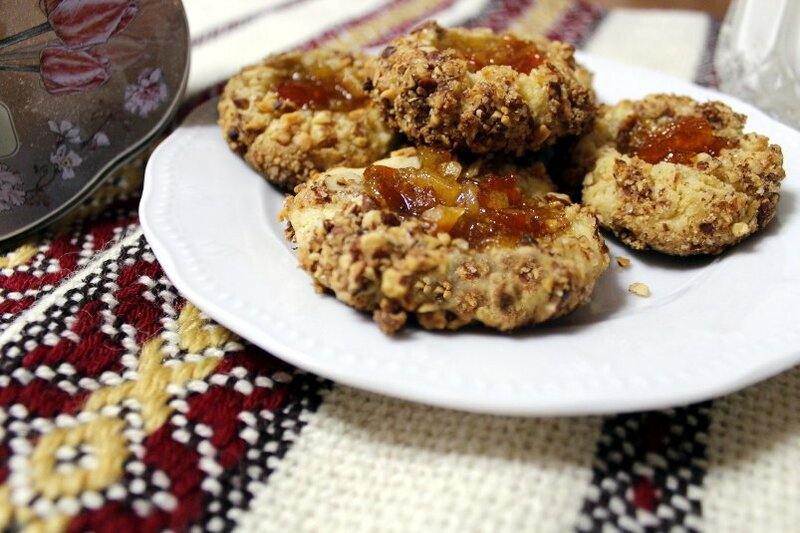 I’ve made these cookies many times with different jams or marmalades or chocolate. I’ve even made them vegan. Depending on the jam, I added a different flavour. For one batch I used kumquat jam which I made in February and for another I made a mixed citrus jam using the two bergamots which were the first to grow on our bergamot tree. Oh, they smelled and tasted soooo good! For those I used citrus essence. I made another batch with quince preserve and for those I used some raspberry essence. For the chocolate ones I used coffeee essence. When making the indent the dough may break but you can easily fix this while they are warm, as they are still soft and you can easily join them again if you want to. I made these cookies when we were in Athens and as my oven is old, I never use the air when baking, so I had to bake the two tins separately. However, if your oven can bake using the air, you can bake both batches together. The baking time was 20 minutes for each batch but I know that if I made them in my fan forced oven at Assini, I would definitely reduce the temperature to 170 degrees C, as well as the time by 3 – 5 minutes, depending on their size. Normal flat cookies take around ten minutes to bake. However, since these are shaped into a ball, it will take a little bit longer and when taking them out of the oven, it takes about 4 – 5 minutes to add the jam, so their temperature drops. So when baking them the second time they need a few more minutes to bake. I usually weigh the cookies to get an even size but I have also used the ice cream scoop, which however makes very large cookies but in you can cut the scooped cookie dough in two and then shape them into balls. It doesn’t make a big difference if they have a couple of grams more or less. To make small ones they weigh from 20 – 23 grams each and they yield around 40 – 42. For bigger ones which weigh 30 – 32 grams each, I get around 35. After weighing them I form them into balls. I quickly whisk the reserved egg white and add some citrus blossom water in the egg, which is optional, but adds more aroma. I wet them with the egg and dip them in the almonds. I then put them in the fridge for at least half an hour for the butter to harden again. You can definitely make them a couple of days ahead and bake them whenever you like. This is a crucial step as if not refrigerated the cookie will not hold its shape and will become flat. One day I decided to make these cookies again but I had only 90 grams of almonds. I did not have time to go and buy more almonds, so instead of coating them with the almonds, I decided to improvise and make something different. The cookie dough was made the same but I substituted 40 grams of flour with 40 grams of unsweetened cocoa powder. I added less icing sugar and subsiituted the remaining with cane sugar and a little bit more. I used only one large whole egg in the batter and when the dough was ready I mixed in the almonds. When I baked them, I melted some chocolate and filled them. Preheat the oven to 180°C (350°F). While the oven is preheating toast the almonds until fragrant, for about 15 minutes. Set aside to cool. Pulse them in a food processor until they are chopped into small pieces and mix in the cane sugar and cinnamon. Sift the flour and cocoa powder and mix in the zest and salt. In a bowl cream the butter with icing sugar, add the cane sugar and the egg and cream until smooth. Mix in the coffee essence. Add the flour mixture and mix until well combined. Add the almonds and mix. Cut the dough into small pieces of about 30 – 32 grams each. When done shape them into balls. Refrigerate for 30 minutes for the butter to harden again. Put half of them in another baking tin, lined with parchment paper and bake for ten minutes. Remove them from the oven and make an indent in the middle, using a round object. Bake for another 5 – 8 minutes depending on your oven. Remove to a wire rack until they cool. Melt the chocolate in a double boiler and add the pepper. Fill the indent with the chocolate and set aside until the chocolate hardens. Note: You can see a white dot in my chocolate cookies. I added a drop of heavy cream in the middle of the chocolate while it was still warm and with a toothpick I tried to make different designs. One of them was this heart! I made these vegan olive oil thumbprints for Lent. As I make a lot of marmalades, this is a great way to use it. I used a mild extra virgin olive oil with a fruity taste. However, if your olive oil is strong add a part of olive oil and substitute the remaining with vegetable oil. I started with the fluid ingredients and then added the flour until the dough was of the right consistency. At the end I weighed the leftover flour to see how much I used. This makes around a hundred cookies but since Lent is almost 50 days they disappear in no time but if you still think they are too many you can always adjust the recipe to make half the amount or give some to your friends and relatives, who will surely appreciate your gesture! Less almonds are needed than the previous recipes as I did not wet them before. However, if you want more almonds, you can wet them with more citrus water or with mandarin juice. In the mixer bowl add the olive oil together with the sugar and beat it for five minutes at full speed. Dissolve the baking soda in the mandarin juice and add it to the mixture, together with brandy, mandarin zest, salt and the spices. Change paddle to dough hook and add the flour. The dough should be soft and not sticky on the fingers. Form them into balls and roll them in the almonds. Preheat oven to 180o C / 350o F and bake them 10 minutes. Remove from the oven, make the indent and add the marmalade. Bake for 5 – 7 more minutes. An easy recipe for a variety of delicious Almond and Cinnamon Thumbprint Cookies with a video tutorial to help you make these cookies. Combine flour with zest, cinnamon and salt. In a bowl cream the butter with icing sugar until crumbs form. Add the egg yolks and one white and cream until smooth. Mix in the essence. Use the spatula to incorporate any leftover flour. Lightly whisk the egg white and mix in the citrus blossom water. Dip each ball in the egg-white mixture and then roll in the toasted almonds, making sure that they are well coated. Put half of them in another baking tin, lined with parchment paper and bake for ten minutes. Remove them from the oven and make an indent in the middle, using a round object. Fill the indent with marmalade or jam and bake for another 5 - 8 minutes depending on your oven. Remove to a wire rack and bake the remaining as well. Buttery shortbread cookies are the best! These thumbprints look very tempting, Ivy.